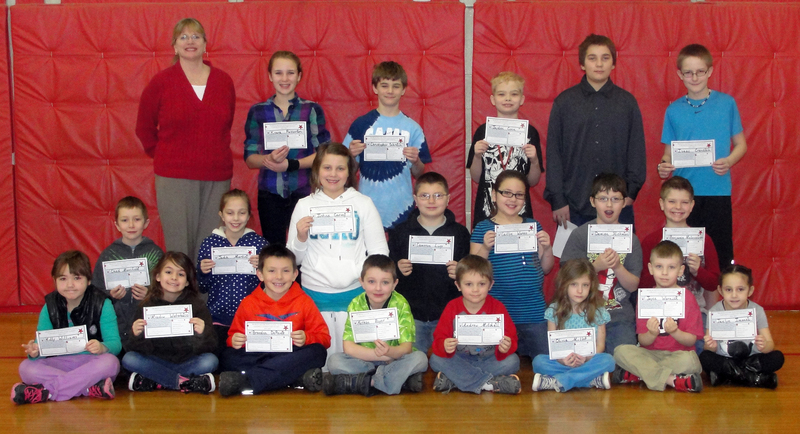 Fairgrieve Elementary School students honored for the March character expectation of “be a problem solver” are pictured. Pictured are Kindergarten students Jaelyn Jimenez, Keaton Kelly, Jayce Wornick, and Trista Sullivan; first grade students Andrew Mitchell, Olivia Miller, Maddison Blake, and Olivia Frataccia; second grade students Braeden DePoint, Nathan Boyer, Tyler Wilson, and Meadow Waterhouse; third grade students Benjamin Maliszewski, Molly Williams, and Eric Orlosky; fourth grade students Damien Hickman, Caitlyn Warne, Cameron Lugo; fifth grade students Justice Carvey, Jada Martin, Chad Mansfield, and Nate Wood; and sixth grade students Keara Patterson, Christopher Schreck, Isaac Crandall, and Jayden Conn. The Fulton City School District’s behavioral expectations include: Be Safe, Be Respectful, and Be Responsible. Fairgrieve Elementary also includes the expectation of Be a Problem Solver.